“Snaggletooth” is back on the prowl. The massive Florida alligator was spotted strutting down Tamiami Trail, a two-lane roadway that cuts through the Florida Everglades. Carol Gowing, an employee at Big Cypress Gallery Adventures, captured cellphone video of the roughly 10-foot-long creature and posted it on Facebook Wednesday. The video garnered nearly 7,000 shares and over 450,000 views in 24 hours. Snaggletooth, "a dominant bull alligator," is an annual visitor at Big Cypress and was out looking for a mate, according to the Facebook page. Alligators typically begin the courtship process in April and mating season occurs in May or June, according to the Florida Fish and Wildlife Conservation Commission. 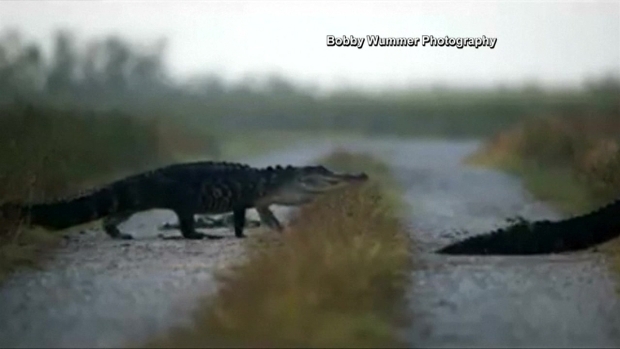 A South Florida photographer was in the Big Cypress National Preserve early Monday when he captured these images of large and small alligators crossing a dirt road. Photographer Bobby Wummer says it was just after sunrise when more than a dozen gators started making their way out of a pond across a road and into a deeper canal. Although the video appears to have been taken at close range, Wummer says he shoots his pictures with a big wildlife lens, so he is certain not to disturb the reptiles. The bigger lens also allows him to stay a safe distance away from his dangerous subjects. "Big Momma" is a female gator who lives in the area and recently had 32 babies, Gowing wrote in the Facebook post, noting Snaggletooth's mate has more on the way. "She has chosen him as her mate, and as he approaches her territory, he gently and softly growls. Those who watch and experience their behavior together believe these sounds to be a part of their unique courtship, something that ties them together for this season," Gowing said. CORRECTION (June 1, 2017, 12 p.m. ET):An earlier version of this story misspelled Carol Gowing's surname.